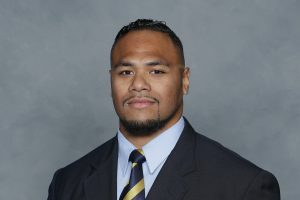 LOGAN, Utah – Bojay Filimoeatu is returning to his alma mater as Utah State’s outside linebackers coach, it was announced Wednesday by Aggie head football coach Gary Andersen. Filimoeatu (Fee-lee-moe-ee-ah-tu) was a two-year starting linebacker at Utah State (2011-12) for Andersen, helping the Aggies to a pair of bowl games and the 2012 Western Athletic Conference title. While at USU, he made 112 tackles (48 solo), eight sacks and one interception. He finished his college career at the 2012 Casino Del Sol College All-Star Game. Following college, Filimoeatu spent the 2014 season playing linebacker for the Oakland Raiders, appearing in eight games. Filimoeatu has spent the past two seasons as the linebackers coach at Mountain West foe San José State and prior to that was a quality control defensive coach at Oregon State in 2016. At SJSU, Filimoeatu coached linebacker Ethan Aguayo to honorable mention all-Mountain West honors this past season as the junior led the Spartans in total tackles with 106 and ranked 29th nationally with an average of 9.6 tackles per game. Aguayo recorded a career-high 20 tackles against Nevada this fall and posted double-digit stops six times during the 2018 season. During the 2017 season, Filimoeatu coached junior linebacker Frank Ginda, who became just the second Spartan linebacker to earn first-team all-Mountain West honors. As a junior, Ginda established a single-season conference record and the eighth-best total by a Football Bowl Subdivision (FBS) player with 173 tackles. His 13.31 tackles per game average presently ranks 20th best among FBS players since the 2000 season when the NCAA standardized defensive statistics. Prior to transferring to Utah State, Filimoeatu spent two years (2009-10) at Mt. San Antonio College in California, earning first-team All-America honors, as well as Defensive Player of the Year, for one publication. He was ranked as the No. 36 overall junior college prospect in the country after making 62 tackles, including 22 for loss, with 13 sacks, eight quarterback hurries, four pass breakups, three fumble recoveries and two forced fumbles during his career. He earned MVP honors of the state and national JC championship games. Filimoeatu attended Granger High School in Utah, where he played linebacker and fullback. He earned All-Region 6 honors as a junior and senior. Filimoeatu, who graduated from Utah State with an interdisciplinary studies degree with an emphasis in sociology and physical education, is married to former USU softball player Hailey Froton. Froton was a two-time all-conference player for the Aggies and is the school-record holder with 132 career RBIs.